We visited Mont Choisy and made our way up the coast to Trou-aux-Biches Beach. Trou-aux-Biches is very accessible and fronts the Trou-aux-Biches Village Hotel. It came to be one of our favorites mainly because it is identical in beauty to the others, and there are a variety of things to do here. For instance, you can bring the little ones and just hang out at the beach – you rest while junior runs back and forth to the water, building a sand castle. After that, you can tour the amazing Mauritius Aquarium close by. The Mauritius Aquarium is host to hundreds of examples of the local sea life. Make sure you see the fish feeding everyday at 11 AM. The Mauritius Aquarium is just down the road in Pointe-aux-Piments. Also near Trou-aux-Biches Beach is an Hindu Temple. It’s just across the coastal road and worth a visit to see this culture. When the day winds to a close, you can have a nice meal at the Trou-aux-Biches Village Hotel, or, if you have sand sticking to you everywhere, and need to make it back to your hotel – take the coastal road south and enjoy a spectacular Mauritian sunset. You’re facing Madagascar, even though it’s too far away to see. 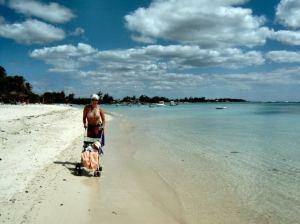 Trou-aux-Biches Beach is another recommended beach on our tour of Mauritius. Stop here, if only for a few pictures of this coast. And if you can, try our itinerary above. Sand – medium grain, coral based, touch of golden. Shade – some umbrellas, trees along beach. Sports – check with the hotel, they have a sports kiosk. Notes – a recommended beach. Don’t forget the Aquarium. So, what is the best beach in Mauritius? Please don't leave us hanging!